Definition at line 44 of file tm-threads.h. Referenced by FlowDisableFlowManagerThread(), FlowDisableFlowRecyclerThread(), TmThreadDisablePacketThreads(), TmThreadDisableReceiveThreads(), and TmThreadRemove(). Definition at line 43 of file tm-threads.h. Referenced by TmThreadKillThreadsFamily(), TmThreadsSlotVarRun(), TmThreadTestThreadUnPaused(), TmThreadWaitForFlag(), and TmThreadWaitOnThreadInit(). Definition at line 47 of file tm-threads.h. Referenced by RunmodeAutoFpCreatePickupQueuesString(), RunModeErfFileAutoFp(), RunModeFilePcapAutoFp(), RunModeSetIPSAutoFp(), and RunModeSetLiveCaptureAutoFp(). Definition at line 48 of file tm-threads.h. 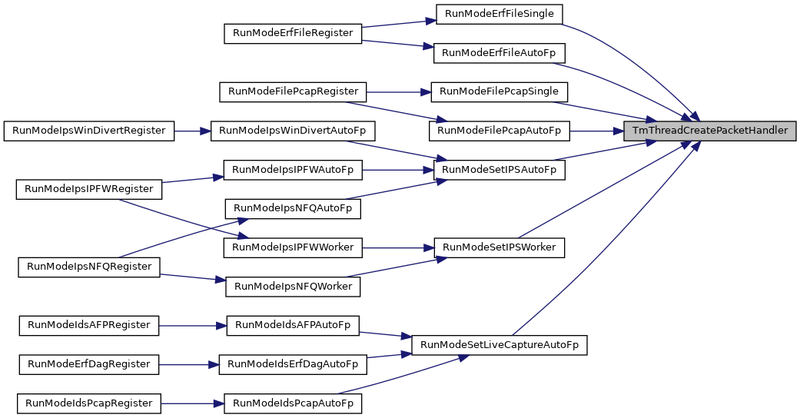 Referenced by DetectLoaderThreadSpawn(), FlowManagerThreadSpawn(), FlowRecyclerThreadSpawn(), RunModeErfFileAutoFp(), RunModeFilePcapAutoFp(), RunModeFilePcapSingle(), RunModeSetIPSAutoFp(), RunModeSetIPSWorker(), and RunModeSetLiveCaptureAutoFp(). Definition at line 50 of file tm-threads.h. Definition at line 2346 of file tm-threads.c. References COPY_TIMESTAMP, Thread_::in_use, SCLogDebug, SCMutexLock, SCMutexUnlock, Threads_::threads, Threads_::threads_size, and Thread_::ts. tm_id TM id of the TM whose slot has to be returned. slots Pointer to the slot. Definition at line 870 of file tm-threads.c. References ThreadVars_::next, SCGetThreadIdLong, SCLogDebug, SCMutexLock, SCMutexUnlock, TmSlot_::slot_next, TmSlot_::tm_id, ThreadVars_::tm_slots, tv_root_lock, and TVT_MAX. tv TV the slot is attached to. data Data to be passed on to the slot init function. Definition at line 821 of file tm-threads.c. References TmModule_::cap_flags, ThreadVars_::cap_flags, TmModule_::flags, TmModule_::Func, TmSlot_::id, TmModule_::Management, TmSlot_::Management, TmModule_::PktAcqLoop, TmSlot_::PktAcqLoop, SC_ATOMIC_INIT, SC_ATOMIC_SET, SCMalloc, TmSlot_::slot_initdata, TmSlot_::slot_next, TmSlot_::SlotThreadDeinit, TmSlot_::SlotThreadExitPrintStats, TmSlot_::SlotThreadInit, TmModule_::ThreadDeinit, TmModule_::ThreadExitPrintStats, TmModule_::ThreadInit, TmSlot_::tm_id, ThreadVars_::tm_slots, ThreadVars_::tmm_flags, TmModuleGetIDForTM(), TmSlot_::tv, and unlikely. 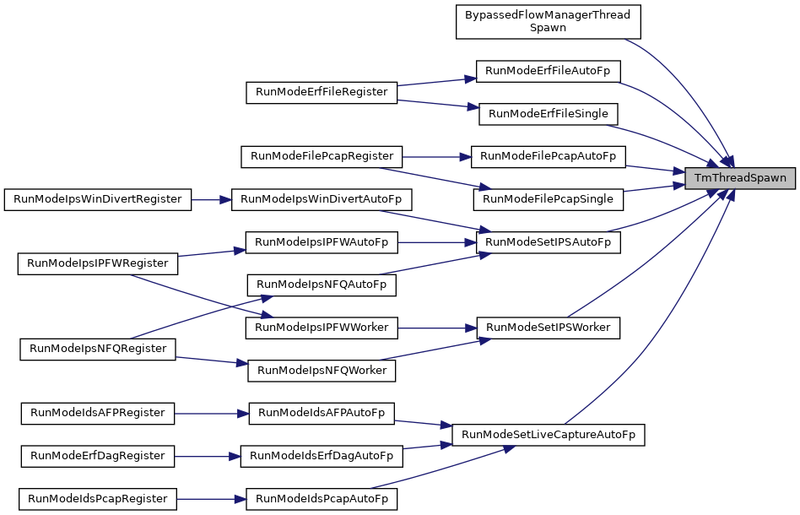 Referenced by RunModeErfFileAutoFp(), RunModeErfFileSingle(), RunModeFilePcapAutoFp(), RunModeFilePcapSingle(), RunModeSetIPSAutoFp(), RunModeSetIPSWorker(), RunModeSetLiveCaptureAutoFp(), TmThreadCreateCmdThreadByName(), and TmThreadCreateMgmtThreadByName(). type holds the type this TV belongs to. Definition at line 1354 of file tm-threads.c. References ThreadVars_::next, ThreadVars_::prev, SCMutexLock, SCMutexUnlock, tv_root_lock, and type. Definition at line 2063 of file tm-threads.c. References FatalError, ThreadVars_::name, ThreadVars_::next, SC_ERR_FATAL, SCMutexLock, SCMutexUnlock, THV_FAILED, TmThreadsCheckFlag(), tv_root_lock, and TVT_MAX. Definition at line 1842 of file tm-threads.c. References ThreadVars_::next, SCMutexLock, SCMutexUnlock, tv_root_lock, and TVT_MAX. Definition at line 1997 of file tm-threads.c. Referenced by TmThreadContinueDetectLoaderThreads(), and TmThreadContinueThreads(). Definition at line 2007 of file tm-threads.c. References ThreadVars_::next, SCMutexLock, SCMutexUnlock, TmThreadContinue(), tv_root_lock, and TVT_MAX. Referenced by main(), and RunModeUnixSocketGetDefaultMode(). Definition at line 2195 of file tm-threads.c. References ThreadVars_::next, SCMutexLock, SCMutexUnlock, ThreadVars_::tmm_flags, tv_root_lock, and TVT_MAX. Creates and returns the TV instance for a Command thread (CMD). This function supports only custom slot functions and hence a function pointer should be sent as an argument. module Name of TmModule with COMMAND flag set. mucond Flag to indicate whether to initialize the condition and the mutex variables for this newly created TV. Definition at line 1328 of file tm-threads.c. References ThreadVars_::id, m, MANAGEMENT_CPU_SET, TmModuleGetByName(), TmSlotSetFuncAppend(), TmThreadCreate(), TmThreadSetCPU(), TmThreadsRegisterThread(), TVT_CMD, and ThreadVars_::type. Creates and returns the TV instance for a Management thread(MGMT). This function supports only custom slot functions and hence a function pointer should be sent as an argument. fn_p Pointer to function when "slots" is of type "custom"
Definition at line 1267 of file tm-threads.c. References ThreadVars_::id, MANAGEMENT_CPU_SET, TmThreadCreate(), TmThreadSetCPU(), TmThreadsRegisterThread(), TVT_MGMT, and ThreadVars_::type. module Name of TmModule with MANAGEMENT flag set. Definition at line 1295 of file tm-threads.c. References ThreadVars_::id, m, MANAGEMENT_CPU_SET, TmModuleGetByName(), TmSlotSetFuncAppend(), TmThreadCreate(), TmThreadSetCPU(), TmThreadsRegisterThread(), TVT_MGMT, and ThreadVars_::type. Referenced by BypassedFlowManagerThreadSpawn(), FlowManagerThreadSpawn(), and FlowRecyclerThreadSpawn(). Creates and returns a TV instance for a Packet Processing Thread. This function doesn't support custom slots, and hence shouldn't be supplied "custom" as its slot type. All PPT threads are created with a mucond(see TmThreadCreate declaration) of 0. Hence the tv conditional variables are not used to kill the thread. Definition at line 1237 of file tm-threads.c. References ThreadVars_::id, TmThreadCreate(), TmThreadsRegisterThread(), TVT_PPT, and ThreadVars_::type. Referenced by RunModeErfFileAutoFp(), RunModeErfFileSingle(), RunModeFilePcapAutoFp(), RunModeFilePcapSingle(), RunModeSetIPSAutoFp(), RunModeSetIPSWorker(), and RunModeSetLiveCaptureAutoFp(). Definition at line 1648 of file tm-threads.c. References PacketQueue_::cond_q, FatalError, Tmq_::id, ThreadVars_::inq, PacketQueue_::len, Tmq_::name, ThreadVars_::name, ThreadVars_::next, Tmq_::reader_cnt, SC_ERR_FATAL, SCCondSignal, SCLogDebug, SCMutexLock, SCMutexUnlock, SleepMsec, THV_KILL, THV_RUNNING_DONE, TmThreadsCheckFlag(), TmThreadsSetFlag(), trans_q, tv_root_lock, TVT_PPT, and Tmq_::writer_cnt. Breaks out of the packet acquisition loop, and bumps into the 'flow loop', where it will process packets from the flow engine's shutdown handling. Definition at line 1552 of file tm-threads.c. References PacketQueue_::cond_q, FatalError, TmModule_::flags, Tmq_::id, ThreadVars_::inq, PacketQueue_::len, Tmq_::name, ThreadVars_::name, ThreadVars_::next, TmModule_::PktAcqBreakLoop, Tmq_::reader_cnt, SC_ATOMIC_GET, SC_ERR_FATAL, SCCondSignal, SCLogDebug, SCMutexLock, SCMutexUnlock, SleepMsec, TmSlot_::slot_next, THV_FLOW_LOOP, THV_KILL_PKTACQ, TM_FLAG_RECEIVE_TM, TmSlot_::tm_id, ThreadVars_::tm_slots, TmModuleGetById(), TmThreadsCheckFlag(), TmThreadsSetFlag(), trans_q, tv_root_lock, TVT_PPT, and Tmq_::writer_cnt. Definition at line 1719 of file tm-threads.c. References TmModule_::name, ThreadVars_::next, SCMutexLock, SCMutexUnlock, TmSlot_::slot_next, TmSlot_::tm_id, ThreadVars_::tm_slots, TmModuleGetById(), tv_root_lock, and TVT_PPT. Definition at line 1041 of file tm-threads.c. References MAX_CPU_SET, ThreadsAffinityType_::nb_threads, SC_ERR_INVALID_ARGUMENT, SCLogError, thread_affinity, and type. It can be used by a thread to control a wait loop that can also be influenced by other threads. Definition at line 1916 of file tm-threads.c. References ThreadVars_::ctrl_cond, ThreadVars_::ctrl_mutex, SC_ERR_FATAL, SCCtrlCondDestroy, SCCtrlCondInit, SCCtrlMutexDestroy, SCCtrlMutexInit, SCFree, SCLogError, and SCMalloc. Definition at line 1781 of file tm-threads.c. References ThreadVars_::id, ThreadVars_::name, ThreadVars_::printable_name, SCFree, SCLogDebug, TmSlot_::slot_next, StatsThreadCleanup(), ThreadVars_::thread_group_name, ThreadVars_::tm_slots, TmThreadKillThreadsFamily(), TmThreadsUnregisterThread(), and TVT_MAX. Definition at line 1752 of file tm-threads.c. References BUG_ON, MAX_WAIT_TIME, MIN, MIN_WAIT_TIME, ThreadVars_::next, SCMutexLock, SCMutexUnlock, SleepUsec, tv_root_lock, and TVT_MAX. Referenced by PostRunDeinit(), and TmThreadKillThreads(). Definition at line 2030 of file tm-threads.c. Definition at line 2040 of file tm-threads.c. References ThreadVars_::next, SCMutexLock, SCMutexUnlock, TmThreadPause(), TmThreadsListThreads(), tv_root_lock, and TVT_MAX. tv The tv instance to remove from the global tv list. Definition at line 1392 of file tm-threads.c. References BUG_ON, PacketQueue_::cond_q, ThreadVars_::ctrl_cond, Tmq_::id, ThreadVars_::inq, ThreadVars_::InShutdownHandler, PacketQueue_::len, Tmq_::name, ThreadVars_::name, ThreadVars_::next, ThreadVars_::outctx, Tmqh_::OutHandlerCtxFree, ThreadVars_::outqh_name, ThreadVars_::prev, Tmq_::reader_cnt, SC_ERR_SHUTDOWN, SCCondSignal, SCLogDebug, SCLogWarning, SCMutexLock, SCMutexUnlock, SleepMsec, ThreadVars_::t, THV_CLOSED, THV_DEAD, THV_DEINIT, THV_KILL, TmqhGetQueueHandlerByName(), TmThreadsCheckFlag(), TmThreadsSetFlag(), trans_q, tv_root_lock, TVT_PPT, type, and Tmq_::writer_cnt. 0 flag is not set. Definition at line 90 of file tm-threads.c. Referenced by DetectEngineInspectBufferGeneric(), FlowDisableFlowManagerThread(), FlowDisableFlowRecyclerThread(), IPFWSetVerdict(), NapatechGetStreamConfig(), StatsSetUI64(), TmThreadCheckThreadState(), TmThreadDisablePacketThreads(), TmThreadDisableReceiveThreads(), TmThreadRemove(), TmThreadsSlotVarRun(), TmThreadTestThreadUnPaused(), TmThreadWaitForFlag(), and TmThreadWaitOnThreadInit(). Definition at line 1025 of file tm-threads.c. References ThreadVars_::cpu_affinity, MAX_CPU_SET, SC_ERR_INVALID_ARGUMENT, SCLogError, THREAD_SET_AFFTYPE, ThreadVars_::thread_setup_flags, threading_set_cpu_affinity, TM_ECODE_FAILED, TM_ECODE_OK, and type. 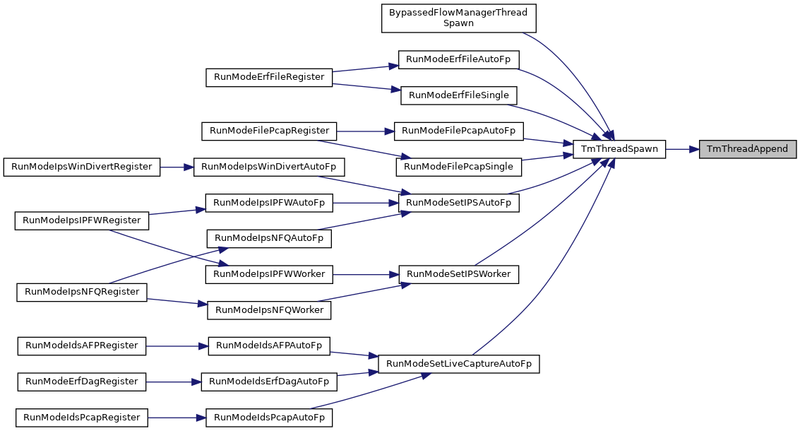 Referenced by RunModeFilePcapAutoFp(), RunModeFilePcapSingle(), RunModeSetIPSAutoFp(), RunModeSetIPSWorker(), RunModeSetLiveCaptureAutoFp(), TmThreadCreateCmdThreadByName(), TmThreadCreateMgmtThread(), and TmThreadCreateMgmtThreadByName(). tv pointer to the ThreadVars to setup the affinity. cpu cpu on which affinity is set. Definition at line 1016 of file tm-threads.c. References ThreadVars_::cpu_affinity, THREAD_SET_AFFINITY, ThreadVars_::thread_setup_flags, and TM_ECODE_OK. Definition at line 1824 of file tm-threads.c. References SC_ERR_RUNMODE, SCLogError, SCStrdup, ThreadVars_::thread_group_name, and unlikely. Definition at line 980 of file tm-threads.c. References ThreadVars_::name, SC_ERR_THREAD_NICE_PRIO, SCEnter, SCLogDebug, SCLogError, SCReturn, and ThreadVars_::thread_priority. tv Pointer to the ThreadVars to setup the thread priority. Definition at line 969 of file tm-threads.c. References ThreadVars_::thread_priority, THREAD_SET_PRIORITY, ThreadVars_::thread_setup_flags, and TM_ECODE_OK. tv pointer to the ThreadVars of the calling thread. Definition at line 1057 of file tm-threads.c. References AffinityGetNextCPU(), ThreadVars_::cpu_affinity, ThreadsAffinityType_::cpu_set, EXCLUSIVE_AFFINITY, ThreadsAffinityType_::hiprio_cpu, ThreadsAffinityType_::lowprio_cpu, ThreadsAffinityType_::medprio_cpu, ThreadsAffinityType_::mode_flag, ThreadVars_::name, ThreadsAffinityType_::prio, PRIO_HIGH, PRIO_LOW, PRIO_MEDIUM, SCGetThreadIdLong, SCLogPerf, thread_affinity, ThreadVars_::thread_priority, THREAD_SET_AFFINITY, THREAD_SET_AFFTYPE, THREAD_SET_PRIORITY, ThreadVars_::thread_setup_flags, TM_ECODE_OK, and TmThreadSetPrio(). Referenced by StatsSetUI64(), and TmThreadsSlotVarRun(). Definition at line 2168 of file tm-threads.c. References ThreadVars_::next, SCMutexLock, SCMutexUnlock, ThreadVars_::t, tv_root_lock, and TVT_MAX. Definition at line 784 of file tm-threads.c. References ThreadVars_::next, SCMutexLock, SCMutexUnlock, TmSlot_::slot_next, ThreadVars_::tm_slots, tv_root_lock, and TVT_MAX. if packet was not accepted, it's still the responsibility of the caller. Definition at line 2382 of file tm-threads.c. References PacketQueue_::cond_q, Tmq_::id, ThreadVars_::inq, PacketQueue_::mutex_q, PacketEnqueue(), SCCondSignal, SCMutexLock, SCMutexUnlock, ThreadVars_::stream_pq, Threads_::threads, Threads_::threads_size, trans_q, and Thread_::tv. Definition at line 2233 of file tm-threads.c. References Thread_::in_use, Thread_::name, SCLogInfo, SCMutexLock, SCMutexUnlock, Threads_::threads, Threads_::threads_size, Thread_::tv, and Thread_::type. Definition at line 1867 of file tm-threads.c. References flags, ThreadVars_::t, THV_INIT_DONE, THV_RUNNING_DONE, TM_ECODE_FAILED, TM_ECODE_OK, ThreadVars_::tm_func, TmThreadAppend(), TmThreadSetFlags(), TmThreadWaitForFlag(), and ThreadVars_::type. 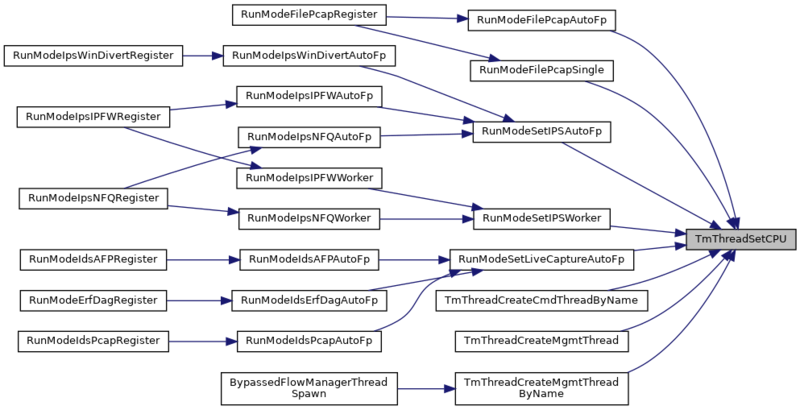 Referenced by BypassedFlowManagerThreadSpawn(), DetectLoaderThreadSpawn(), FlowManagerThreadSpawn(), FlowRecyclerThreadSpawn(), NapatechStartStats(), RunModeErfFileAutoFp(), RunModeErfFileSingle(), RunModeFilePcapAutoFp(), RunModeFilePcapSingle(), RunModeSetIPSAutoFp(), RunModeSetIPSWorker(), RunModeSetLiveCaptureAutoFp(), and StatsSpawnThreads(). Definition at line 2254 of file tm-threads.c. References BUG_ON, Thread_::in_use, ThreadVars_::name, Thread_::name, SCCalloc, SCMutexLock, SCMutexUnlock, SCRealloc, STEP, Threads_::threads, Threads_::threads_size, Thread_::tv, and Thread_::type. Referenced by TmThreadCreateCmdThreadByName(), TmThreadCreateMgmtThread(), TmThreadCreateMgmtThreadByName(), and TmThreadCreatePacketHandler(). Definition at line 98 of file tm-threads.c. Referenced by DetectEngineInspectBufferGeneric(), FlowDisableFlowManagerThread(), FlowDisableFlowRecyclerThread(), NapatechGetStreamConfig(), StatsSetUI64(), TmThreadCreate(), TmThreadDisablePacketThreads(), TmThreadDisableReceiveThreads(), TmThreadPause(), TmThreadRemove(), and TmThreadsSlotVarRun(). Definition at line 2330 of file tm-threads.c. References SCMutexLock, SCMutexUnlock, Threads_::threads, Threads_::threads_size, Thread_::ts, and unlikely. Deal with post_pq for slots beyond the first. Definition at line 116 of file tm-threads.c. References BUG_ON, EngineDone(), Tmq_::id, TmSlot_::id, ThreadVars_::inq, PacketQueue_::len, TmSlot_::Management, PacketQueue_::mutex_q, ThreadVars_::name, PACKET_PROFILING_TMM_END, PACKET_PROFILING_TMM_START, PacketDequeue(), PacketPoolDestroy(), PacketPoolInit(), PacketPoolInitEmpty(), TmSlot_::PktAcqLoop, SC_ATOMIC_GET, SC_ATOMIC_SET, SC_ERR_FATAL, SC_ERR_THREAD_INIT, SCDropCaps, SCLogDebug, SCLogError, SCLogNotice, SCLogWarning, SCMutexInit, SCMutexLock, SCMutexUnlock, SCSetThreadName, SleepUsec, TmSlot_::slot_initdata, TmSlot_::slot_next, TmSlot_::slot_post_pq, TmSlot_::slot_pre_pq, TmSlot_::SlotThreadDeinit, TmSlot_::SlotThreadExitPrintStats, TmSlot_::SlotThreadInit, StatsSetupPrivate(), StatsSyncCounters, ThreadVars_::stream_pq, suricata_ctl_flags, ThreadVars_::thread_setup_flags, THV_CLOSED, THV_DEINIT, THV_FAILED, THV_FLOW_LOOP, THV_INIT_DONE, THV_KILL, THV_KILL_PKTACQ, THV_PAUSE, THV_PAUSED, THV_RUNNING_DONE, TM_ECODE_DONE, TM_ECODE_FAILED, TM_ECODE_OK, ThreadVars_::tm_func, TmSlot_::tm_id, ThreadVars_::tm_slots, TMM_FLOWWORKER, ThreadVars_::tmqh_in, ThreadVars_::tmqh_out, TmqhOutputPacketpool(), TmqhReleasePacketsToPacketPool(), TmThreadsCheckFlag(), TmThreadSetupOptions(), TmThreadsSetFlag(), TmThreadsSlotVarRun(), TmThreadsUnsetFlag(), TmThreadTestThreadUnPaused(), TmThreadWaitForFlag(), PacketQueue_::top, trans_q, and unlikely. Definition at line 2297 of file tm-threads.c. References Thread_::in_use, SCFree, SCMutexLock, SCMutexUnlock, Threads_::threads, Threads_::threads_cnt, and Threads_::threads_size. Definition at line 106 of file tm-threads.c. Referenced by StatsSetUI64(), TmThreadContinue(), and TmThreadsSlotVarRun(). The function would return if the thread tv has been unpaused or if the kill flag for the thread has been set. tv Pointer to the TV instance. Definition at line 1965 of file tm-threads.c. References SleepUsec, THV_KILL, THV_PAUSE, and TmThreadsCheckFlag(). Waits till the specified flag(s) is(are) set. We don't bother if the kill flag has been set or not on the thread. Definition at line 1983 of file tm-threads.c. Referenced by NapatechGetStreamConfig(), StatsSetUI64(), TmThreadSpawn(), and TmThreadsSlotVarRun(). Used to check if all threads have finished their initialization. On finding an un-initialized thread, it waits till that thread completes its initialization, before proceeding to the next thread. Definition at line 2091 of file tm-threads.c. References ThreadVars_::name, ThreadVars_::next, SC_ATOMIC_GET, SC_ERR_THREAD_INIT, SCLogError, SCLogNotice, SCMutexLock, SCMutexUnlock, SleepUsec, THV_CLOSED, THV_DEAD, THV_FAILED, THV_INIT_DONE, TM_ECODE_FAILED, TM_ECODE_OK, TmThreadsCheckFlag(), tv_root_lock, TVT_MAX, TVT_MGMT, and TVT_PPT. Definition at line 79 of file tm-threads.c. Referenced by DetectEngineInspectBufferGeneric(), FlowDisableFlowManagerThread(), FlowDisableFlowRecyclerThread(), StatsSetUI64(), TmThreadContinueDetectLoaderThreads(), and TmThreadWakeupDetectLoaderThreads(). Definition at line 82 of file tm-threads.c. 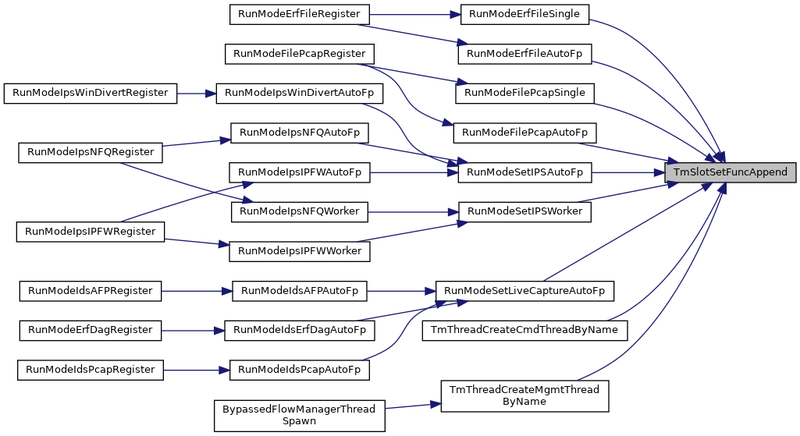 Referenced by DetectEngineInspectBufferGeneric(), FlowDisableFlowManagerThread(), FlowDisableFlowRecyclerThread(), TmSlotGetSlotForTM(), TmThreadAppend(), TmThreadCheckThreadState(), TmThreadClearThreadsFamily(), TmThreadContinueDetectLoaderThreads(), TmThreadContinueThreads(), TmThreadCountThreadsByTmmFlags(), TmThreadDisablePacketThreads(), TmThreadDisableReceiveThreads(), TmThreadGetFirstTmSlotForPartialPattern(), TmThreadKillThreadsFamily(), TmThreadPauseThreads(), TmThreadRemove(), TmThreadsGetCallingThread(), TmThreadsGetTVContainingSlot(), TmThreadWaitOnThreadInit(), and TmThreadWakeupDetectLoaderThreads().